In order to help us identify our dead inventory, we have to create slow moving inventory report. here we have to see, When was the product last sold and The dead stock means, zero sales in the past 12 months. Once we have defined the time of product death, we need to create a report based on this. Identifying dead products is not an annual event. running the dead stock report on an annual basis, is not a good suggestion. We need to be far more proactive than this. If we employed this method, we could tack on an additional 11 months of inventory carrying cost to any items that died in February. we need to know what died every month. so if we Make this report a part of our first day of the month routine means, it is easy to identify how much dead stock is there for every month. this is the importance of slow moving inventory report..
common column for these two tables is inventory_item_id. 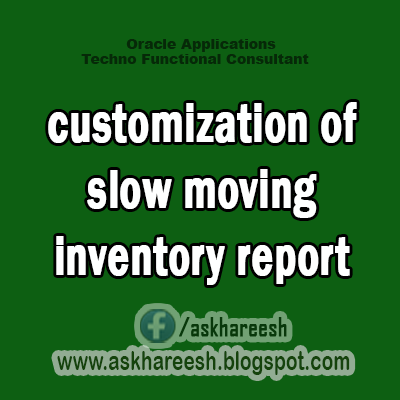 the process of customization is, have taken standard slow moving inventory report and renamed that report with some other name. and placed the report in server. and went to system administrator responsibility and took standard report in concurrent program, and gone through copy to button and renamed that program name and short name. and in the executable part taken report name as executable file name and saved the changes that i have made. and added this report to inventory responsibility. and did changes in the renamed report. in the data model added ,required two columns in the sql code. after adding those, i have assigned those two fields in the respective group(because if add columns in the sql code those two fields will come down to the lowest group so assigned those two fields in respective groups). and coming to layout part, selected two fields and placed it respective repeating frame and assigned source to those two fields. here have to be careful in the process of placing the fields in the repeating frame..after doing changes, compiled the report, if compilation is successful means, and placed that report in the server, and gone to inventory module and submit the request for that respective concurrent program. if the request came normal means, then taken print out for that output. if that output is error out means, seen the error in view log, again gone through report and made the changes according to that error message and saved the report. compiled. again and placed that report in the server and submitted request in the inventory responsibility, until getting the request condition as completed and normal.